A Dance for Sister Dora. Glorishears performed their brand new dance dedicated to the life and achievements of Walsall’s Sister Dora at the Walking the Fair event in April 2012. 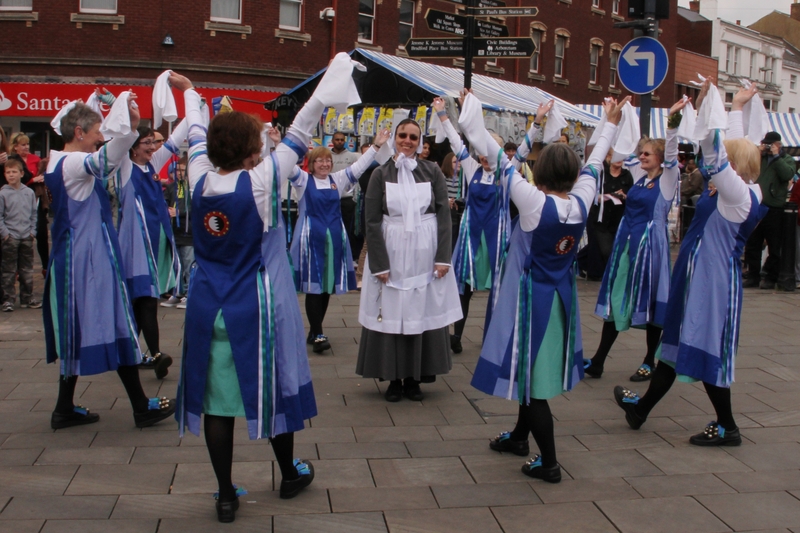 Glorishears are a women’s side who have been in existence since 1978 and dance mostly Cotswold dances. Although our members live mostly in Birmingham, several come from the nearby Walsall. They are familiar with Sister Dora not only because there is a statue to this remarkable woman in the city centre, but her life is recorded in a church stained glass window and at the local museum. Sister Dora was born as Dorothy Wyndlow Pattison on Yorkshire in 1832. As she grew up she dreamed of leaving home and leading an independent life. After her mother’s death she was left enough money to escape and became a school teacher. But her passion was for nursing and she was inspired by the work of women such as Florence Nightingale. In 1864 Dorothy joined the Christ Church sisterhood and became Sister Dora. She was sent to work at the cottage hospital in Walsall, helping with minor operations and general nursing. When the hospital was relocated, Sister Dora was put in charge of all the domestic arrangements, making it the most economical in the country. Her devotion to her duties made her widely admired and loved, and when, in 1875 Walsall was in the grip of smallpox, she nursed at the Epidemic hospital for six months. In 1877 she was diagnosed with breast cancer which she kept secret. She was returning to Walsall from observing Joseph Lister’s work on antiseptic surgery when she collapsed in Birmingham. She insisted on returning to Walsall where she died in 1878. So it was decided that Glorishears would create a dance, based on the Adderbury tradition, in her memory. No suitable tune? No problem, one of the Walsall contingent wrote one. Costume needed for a Sister Dora character? No problem, another Walsall dancer whizzed one up. Chant needed for the beginning? Again, no problem. Finally the dance emerged. One of us, dressed as Sister Dora, interacts with the other six or eight dancers in a chorus to represent her moving amongst the people, leading and supporting them, bringing help and relief. The figures of the dance represent her faith as she remains true to her beliefs, while life continues around her. Finally the dancers leave Sister Dora after circling her in salute and praise. Fittingly the very first public performance of this dance was before the Mayor and people of Walsall, at the ancient ceremony of Walking the Fair. This involved a procession to mark the presentation of the Royal Charter in 1662 , given to Walsall by Charles 1. And it ended at the foot of Sister Dora’s statue.